Author and surveillance lawyer Jennifer Stisa Granick conveys the complex context and legal in terms understandable to non-experts. For surveillance academics, American Spies provides footnotes, a glossary, and references. Mass surveillance that targets foreigners also sweeps up Americans—it’s not intentional, that’s just how mass surveillance works. Modern surveillance lacks public oversight, depends on secret law, and is incompatible with a free society. Privacy law has fallen behind due to technology, economics, and consumer acceptance. Due to judicial and legislative deference to the executive branch of government in America, privacy law is unlikely to catch up. As surveillance laws are secret or broad in interpretation with loopholes and no penalties, does privacy law even matter? September 11, 2001 became the justification for broad suspicionless surveillance. For the FBI this meant a redirection from law enforcement to intelligence. Granick states the NSA and the FBI are not rogue agencies in all of this, their actions reflect their duties to the President. You did not need laws to protect you from something that was physically impossible. But now that it is possible, mass or bulk surveillance means indiscriminate collection— collecting it all. The NSA processed more than two billion telecommunications per day in 2012, including all Gmail and video chats from overseas. It is near impossible to separate American data from foreign data, so it is not. 500,000,000,000,000,000,000 pages of text. In March 2013, 97 billion pieces of information was collected and stored by the NSA. How many Americans have been swept up in data collection? The NSA refuses to say, and it’s possible it doesn’t even know. Granick claims, “Mass surveillance and democracy are fundamentally incompatible.” And now that technology enables the government to perform mass surveillance, there are few laws in place that address its legality. Bulk collection began in 2001 illegally. The NSA and FBI broke the law, then hid the fact that they broke the law. After the bulk collection program was uncovered by a U.K. newspaper in 2013, Democrat and Republican Senators, provided misleading statements to the public. When an official says that data on Americans are no longer being collected under law X, it does not mean that right now the very same data isn’t being collected under law Y.
Granick states that there is a pattern to how the intelligence community acts when caught, they “[p]ut a respected figure on television to issue reassuring statements that leave the American public with an inaccurate understanding of what is actually going on.” The U.S. government did not seek a legal blessing by court order until 2016. There’s a chapter on NSA cyber spying and hacking. The NSA has stolen stealing encryption keys, and subverted encryption standards. The NSA has hacked the Microsoft software update process. The NSA uses drones with cell phone interception equipment and taps cables connected to cell phone networks. The NSA works with the U.K.’s spy agency GCHQ, to spy on the rest of the world; however, the NSA’s charter prevents the NSA from spying on Americans. But it does, by legal shell game. When the FBI receives 100 million customer phone service records from Verizon, the FBI hands the records over to the NSA. It‘s not just the government, states Granick. 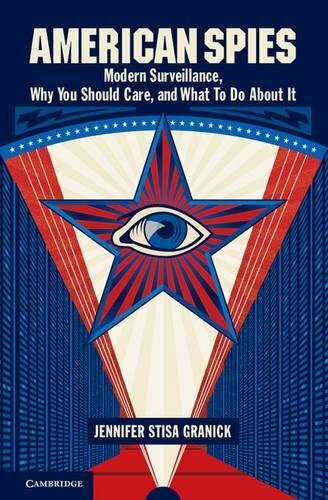 “Spying is thriving not only because of new technology, but also because of modern business models.” People give up their data freely to commercial companies to obtain products and services, and then U.S. spies buy or steal that data from corporations. She provides an overview of Snowden’s revelations, pointing out “Snowden’s disclosures have changed the way the public understands what surveillance means today.” She adds that Snowden did the right thing and criticism of his actions is facile and misguided. She claims, “[t]he ‘is Snowden a traitor’ discussion isn’t actually about Snowden,” a claim similarly expressed by retired CIA agent Melvin A. Goodman in Whistleblower at the CIA, previously reviewed in NYJB. As a consequence of Snowden there has been some pushback. President Obama stopped collecting bulk email metadata—for a while. Bulk data is still being collected but the process of collection changed. Instead of stealing the metadata itself, the NSA under a different law goes to the telecom agencies to obtain the data, though still without a warrant. Though much of this has already been reported, what makes American Spies of value is Granick’s perspective as a lawyer. What may be most interesting for the layperson is her uncovering of fraud in surveillance law. Legal terms have been perverted to the purpose of allowing those who run the spy agencies to deny they are spying. By denying that Americans have any expectations of privacy, a warrant is not required; if a warrant is not required then spying cannot have occurred and authorities can go fishing for phone billing records, Internet transactions, and the contents of hard drive backups stored on the cloud, and all without a warrant. There are more loopholes. Warrants must identify a “target” for surveillance but the word “target” is undefined. Targets can be “bulk,” that is, targets can be groups of people having a common attribute. Other vague legal terms include “metadata,” which legally isn’t data (although it is). Another legal term is “Incidental,” which means its opposite as incidental collection of American data is intentional. Another legal term is “Inadvertent,” which also means its opposite, i.e. significant and systemic. And as the legal term “search” has protections under the Fourth Amendment, the word “query,” which has no legal baggage is used instead. Similarly, the legal definition of “terrorism” is not precise and can be (and has been) misused by law enforcement to suppress unfavored views and civil disobedience. Of special import is the term “minimized,” which means data is analyzed with identity information “masked,” and then shared across government agencies. Because data minimization permits data sharing, the FBI can ask for data that the NSA isn’t allowed to collect, and then hand the data over to the NSA. Also because of data sharing, the NSA can share incidentally collected data on Americans with the FBI, the DEA, the IRS, and other law enforcement agencies, including foreign spy agencies. When the FBI does the spying (compared to the CIA and NSA) there are more protections afforded Americans; however in regards to who is and who is not an American, the definition of American is classified. So when the president says that Americans need not be worried about surveillance, we really don’t know what he means. One might guess that an American could be assumed to be not-an-American if they meet certain criteria, such as sending email in a foreign language, or being on a chat list with a foreigner. But we really don’t know. In the chapter We Kill People Based on Metadata, Granick explains what metadata is, how it is generated, and what it says about us. Location data is metadata. Mobile phones are essentially location trackers; “tower dumps” of cell phone towers give police position identifiers for cell phones as even when off, cell phones will at intervals connect to cell towers. There are street cameras, traffic light cameras, security cameras, and auto license plate readers. This too is metadata. Some if not all of the metadata ends up in searchable databases as business records. The government doesn’t have to pick and choose whom to wiretap; they can just demand the data as metadata from private industry. Granick provides context on how we got to where we are—basically, everything changed after September 11, 2001. The conclusion of the National Commission on Terrorist Attacks, The 9/11 Commission, was not that there was a lack of information but the information the CIA and NSA had, was misused; they did not share their information with the FBI; there was an “inability to connect the dots.” The commission’s conclusion became the justification for broad suspicionless surveillance, and a change of direction for the FBI from law enforcement to surveillance and intelligence. The consequence is there is now too much surveillance, and too much data sharing. Even with minimization procedures, there is the potential for misuse of law enforcement through discrimination, retaliation, and blackmail. Granick also examines various Executive Orders (EOs) and laws on surveillance subject to different implementations and interpretations. One law is EO (12333; another is Section 702 of The FISA (Foreign Intelligence Surveillance Act) Amendments Act of 2008. In the chapter Nothing to Hide? A Short History of Surveillance Abuses, Granick provides context for modern surveillance law and protections leading up to September 11, 2001. Granick points out that surveillance has been misused for political reasons for most of American history and used to go after individuals and groups that the president considers politically suspect . The FBI, initially created to monitor anarchists, sponsored the Palmer Raids in the 1920s that prioritized urgency over legality (where have we heard that before?). The Palmer Raids swept up and deported many non-violent illegal aliens along with anarchists and communists. During the Vietnam War, the FBI kept an antiwar list that grew until more than one million Americans were targeted. Anti-war demonstrators were investigated by the IRS, identified by photocopies of checks used to reserve seats on buses headed to antiwar events. Ironically President Nixon was put on the list for belonging to the Quakers, a Christian group known for its anti-war activities. Today’s FBI surveillance list includes not just anti-war groups but also Black Lives Matter, PETA, journalists, and Muslims. Granick explains how wiretapping fits into current law, which appears to be a slippery slope in what starts out as sensible expands over time into abuse. Historically, there was no law placing a check on wiretapping until Katz 1967, where the “right to privacy” was first discussed by the Supreme Court. Katz 1967 was followed by The Wiretap Act of 1968, which was then followed by Keith 1971, which resulted in all Americans having a “reasonable expectation of privacy,” and the need for a warrant based on probable cause to invade that privacy. Privacy law leaves questions on what the president can do to override Fourth Amendment protections under claims of national security. Overrides were made on a case-by-case basis up to FISA 1978, the Foreign Intelligence Surveillance Act. Granick states the FISA is, “an extraordinarily complex statute,” and outlines the legal rules. Foreign intelligence surveillance allows surveillance of U.S. citizens without judicial review, if those citizens are believed to be acting as agents of a foreign power. Much of what is legal and what is not comes down to hair splitting, leaving much room for interpretation. That phone calls are private but phone numbers dialed are not goes back to Smith v. Maryland 1979. Phone numbers are considered business records of the phone company —and thus do not require a warrant. The claim “if data isn’t a secret, then it isn’t private and Fourth Amendment protections don’t apply” became thin edge-of-the-wedge that allowed a loophole around the Fourth Amendment by use of “The Third-Party Doctrine,” allowing access to any third-party records without warrant. Granick explains the qualitative difference between telephone metadata and email metadata. Making phone calls and sending email use significantly different technologies and telephone metadata holds much less information than email metadata. As email metadata contains more information it should be more strongly protected, yet under current surveillance law, telephone, and email records are treated the same. The Electronic Communications Privacy Act (ECPA) and the Stored Communications Act (SCA) of 1986 added legal process (though still less than a search warrant) to obtain customer records, except in certain circumstances, for certain records. As the law is not settled in all aspects (by “settled” meaning not yet decided by the Supreme Court), these laws are open to interpretation. Much depends on the ongoing legal challenge of Riley v. California 2014 currently before the Supreme Court—though this particular case does not address email metadata. For more on how we got to where we are today, Granick provides a history and context secret laws passed after September 11, 2001. First, the Department of Justice (DOJ) Office of Legal Counsel (OLC) immunized government representatives from criminal and civil liability, which provides a “get out of jail free” card if the crimes they commit are done in the belief that they are doing the right thing. The point was to protect officials from later being sued personally after the fact, if secret law was discovered and overturned. Then mass collection was authorized secretly under “Section 215” of the Patriot Act. Interpretation of this law allowed the NSA to spy on Americans outside of its original legal charter. John Yoo, a junior member of the OLC (who also wrote the legal opinion permitting torture) wrote the legal opinion on STELLARWIND—the code name for secret surveillance. Granick notes that secret opinions were not reviewed by a judge because secret opinions were not allowed to be reviewed. There are many ways for the executive branch to avoid legal challenge in the courts, for example the need for “legal standing.” For legal standing on a Fourth Amendment surveillance case a defendant would have to prove he or she was spied on. Proof is hard to come by because if proof existed it would have to been secret, that is, the proof would have to have been illegally obtained. Another legal tactic is through plea-bargaining. Defendants to “plea out” to a reduced sentence to avoid the risk of a jury decision but in doing so also avoid challenging the law. Yet another tactic is through use of “parallel construction.” Parallel construction is an alternate legal explanation of how surveillance information was obtained. Yet another is pre-compliance that has been built into laws requiring government licenses to operate. For example, FCC approval of foreign ownership of U.S. telecoms requires their acceptance of government surveillance. In chapter 15, The Failures of External Oversight, Granick provides the context and history of the Foreign Intelligence Surveillance Court (FISC). FISC was created to provide oversight over surveillance of foreigners in the U.S., Secret spying on Americans was made legal through the FISA court, though the court has little power. Granick states, “[t]he record shows that the FISC is not in the business of saying ‘no.’” For example, when the NSA was caught doing something not allowed and FISA judges on record asked the NSA why they ignored the government rule, the NSA “provided no comprehensive explanation” and got away with it. No one was punished. FISA later changed the rules to make NSA rule violations permissible. The last chapter addresses how to make things better (sigh). American Spies is well organized, to the point, and thoroughly depressing.